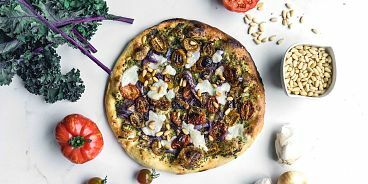 Virtuous Pie, opening Saturday, September 10th in Chinatown, is an elevated fast-casual restaurant, focused on handcrafted plant-based pizzas, non-dairy ice creams, and seasonal salads, featuring local beer and wine on tap. Vesal, former Head Chef at Cocktails & Canapes Catering and Earls Yaletown, is making all of the key ingredients in-house, including his own cultured nut-based cheeses. He’s also driving an innovative menu by incorporating some unexpected toppings, like falafel and harissa on The Med pizza, and gochujang braised jackfruit and spicy kimchi on the Kim Jack-Il. All pizzas are prepared fresh to order and ready in six minutes or less, making it an ideal dining destination for time-pressed lunch seekers. Dinner guests are invited to linger over drinks, including beer from Four Winds and 33 Acres breweries by the bottle, and kombucha, Nitro brew, and BC’s Haywire wine, all on tap. In addition to handcrafted pizzas, the restaurant is also feeding Vancouver’s ice cream obsession by offering a selection of house-made cashew, coconut and almond milk-based “ice creams” with rich flavours like Turmeric + Black Pepper, Donuts + Coffee, and Mint + Dark Chocolate Chunk. Virtuous Pie’s “food with roots” tagline plays to the fact that the restaurant serves a 100% plant-based menu, but also that the team is committed to establishing strong ties to the neighbourhood it calls home. “It’s really important to us to create a menu, a space and an environment that aligns with our core values, and a big part of that is becoming a meaningful part of this community,” says Lia Loukas, VP’s Director of Marketing. To that end, Virtuous Pie is committed to connecting to and building relationships within their community. This includes supporting organizations like the Pivot Foundation, a charitable organization that champions the rights of Vancouver’s Downtown Eastside residents, and getting involved at a grass roots level with Mosaic BC and Growing Chefs. Vancouver’s award-winning interior design agency House of Bohn designed the restaurant, drawing inspiration from old world Italy while also injecting a modern, bright, and clean twist in keeping with a fast-casual atmosphere. The 1,100 square foot space incorporates a variety of natural materials and textures, including marble, vintage brick, travertine and local wood. The ceramic red-tiled restrooms pay homage to Chinatown, and everything, from the brass lighting to the tables and benches, is custom and locally made.